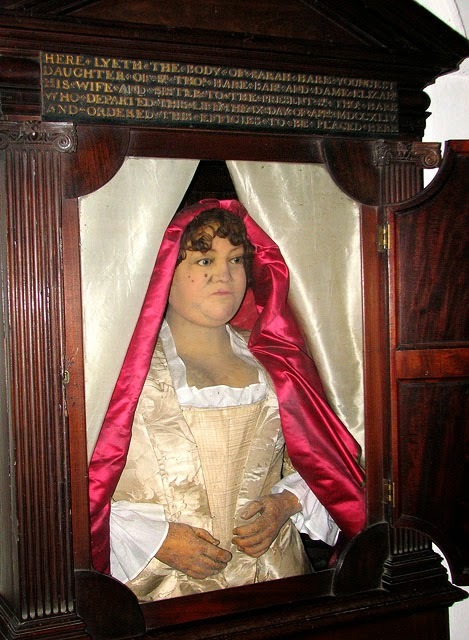 Sarah made no extraordinary contributions to this world except one – a wax effigy of herself, the only such mortuary statue of its kind in England outside of Westminster Abbey. (Most mortuary statues at the time were made of marble.) She was the youngest daughter of Sir Thomas Hare of Stow Hall in Stow Bardolph, Norfolk, where the family lived in a Jacobean style red-brick mansion. The Hare family had lived in a house on that site since 1589 and played a significant role in the village of Stow Bardolph. In 1622, Sir Ralph Hare built six almshouses and provided them with 86 acres of land for division among the inmates.